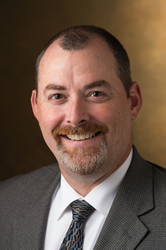 Southern Illinois University Edwardsville’s Mark Luer, PharmD, FCCP, has been named interim dean of the School of Pharmacy (SOP). Luer replaces Gireesh Gupchup, PhD, who has completed a successful term as dean of the SOP and will now be serving the School and the University in other strategic roles. SIUE School of Pharmacy Interim Dean Mark Luer, PharmD, FCCP. Dr. Luer’s contributions to the SIUE School of Pharmacy, his understanding of students’ needs and his expressed commitment to serving all academic programs will position the School well for continued success. SIUE School of Pharmacy: Today’s pharmacists improve patients’ lives through the medication and education they provide. Dedicated to developing a community of caring pharmacists, the SIUE School of Pharmacy curriculum is nationally recognized as a model that offers students a unique combination of classroom education, research, community service and patient care. The School of Pharmacy’s areas of excellence include a drug design and discovery core; pediatric practice; chronic pain research and practice; and diabetes research and practice. As the only downstate Illinois pharmacy doctorate program, the SIUE School of Pharmacy is addressing the growing need for highly trained pharmacists in a rapidly growing field.